Partly it started because my sister Sarah and her boyfriend Matt came to stay with us in New York from London. Sarah is a wine buyer, so we left that bit up to her, while Jon went zooming off to the shop to pick up the ingredients for gin and tonics, margaritas, seabreezes and lots and lots of beer. Then, of course, we ended up mostly going out and now we have a fridge with more beer in it than food, which is not the usual way of things by any means. And then Adam brought his brand new boyfriend (stealth dating for a little over a month) to say hello, and I made truffle mac n cheese in an attempt to out-do Jon’s incredibly and universally successful signature dish. It was basically his recipe, with added truffle oil at the end. And I took all the credit. So there was enough mac n cheese left over to feed a boat-load of rowers (yay Oxford on an awesome Boat Race, BTW! ), and enough beer to render them unconscious. So basically, it’s been a good week. Brush the mushrooms to clean. Chop them, then fry them in a tsp of butter and a splash of olive oil until they are browned. Season well, then stir in the truffle oil. 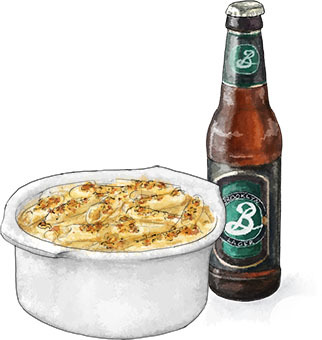 This entry was posted in The Wednesday Tipple and tagged Adam, beer, boatrace, campanelle, cheddar, cheese, crimini, Delicatessen, gruyere, mac n cheese, macaroni, mushroom, parmesan, pasta, truffle, truffle oil. Bookmark the permalink. Wasn’t Oxford great this year! Will have to try this recipe too as getting withdrawals! Yay Oxford. such an exciting race. You should make the mac n cheese. It’s so good. Do you have truffle oil? It the most useful thing ever – well, for a given definition of ever – pasta, splash of cream, pepper, truffle oil = feast.